After you press play on Stray Cats: Live At Rockpalast, you best buckle up, because not only are you in for one live thrill ride, you’re in for two, as Stray Cats: Live At Rockpalast houses a pair of the seminal group’s performances at the annual Rockpalast in Europe, from 1981 and 1983. Uncontrollable and spastic are the names of the game here on Stray Cats: Live At Rockpalast, which captures the bands stage show in Cologne, July, 16th 1981, and Loreley, August 20th 1983. Perhaps the best part here is that neither setlist is the same, so more bang for your buck as they say. The look and the sound of Stray Cats: Live At Rockpalast is flawless, which just adds to the enjoyment. Things are fast and furious, so you best not blink, as the band does not miss a beat (quite literally in fact), blowing through such favorites as the pure energetic madness that is “Rumble In Brighton,” “Runaway Boys” and “Stray Cat Strut,” as well as “Rock This Town” and “Storm The Embassy.” Plucky, upright bass, standing drumming, Gretsch guitars, Brian Setzer’s swaying hips, it’s all here, and hearing the crowd chant ‘Stray Cats’ after “Gonna Ball” in Cologne is a memorable moment. Sure, there are no extras to speak of, but you’re coming for these two rare live sets, not some random photo gallery or trivia or something. 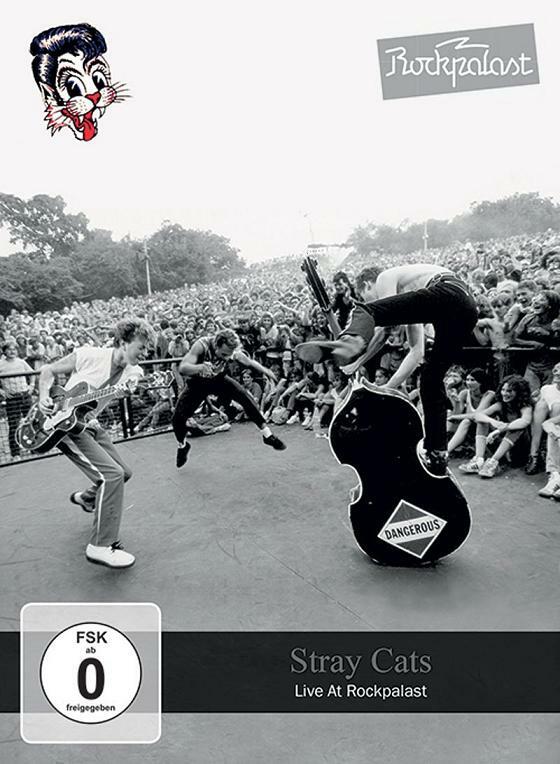 Stray Cats: Live At Rockpalast is a must-must-must-have for Stray Cats fans and a must for any fans of unique live performances.